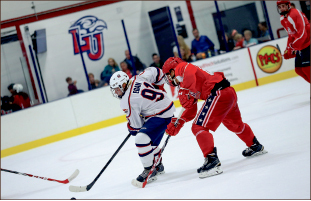 While the Liberty Flames men’s division I (DI) hockey team began a new season with nine new players and a new playbook Friday night, they posted a 7-2 win over the Potomac Patriots Junior A team in decidedly old fashion. It was captain Matt Sherry and alternate captain Lindsay LeBlanc, both seniors and veterans within the Flames hockey program, who set the tone for their team. LeBlanc anchored the starting front line with freshmen Luke Hannon and Luke Simon, setting them up to score within the first five minutes of the game. LeBlanc went on to assist on three more goals, including one of Sherry’s two. Sherry, who like LeBlanc, was paired with a first-year player in defenseman Peter Shantz, offered the Flames crucial stability in the neutral and defensive zones and timely scoring to boot. His first goal came in a hectic second period to put the Flames up 4-2, stall the Patriots scoring hopes and set up Liberty for a strong, three-goal third period. Head Coach Kirk Handy agreed with his team leadership, noting that the Flames got stronger as the game progressed. He praised Sherry and LeBlanc for their solid play and example throughout. After all, the two returned more than just athleticism — they brought experience and the Flames traditional values to a new generation of the hockey program. Hannon and Simon had an immediate offensive impact with one goal and two assists apiece. Fundamental defenseman Ben Hughes found the back of the net. Shantz delivered staggering body checks, and faceoff specialist Grant Garvin won all but two off the drop throughout the game. The Flames freshmen lived up to their hype, but the consistent play and presence of Liberty’s respected returners grounded the team’s performance noticeably in its first outing of the year. With returning leadership guiding the way and the first win under their belts, the Flames look forward to progressing further. For all the newness of the hockey club, the ultimate goal is older than them all — one win at a time, right up to a national championship. 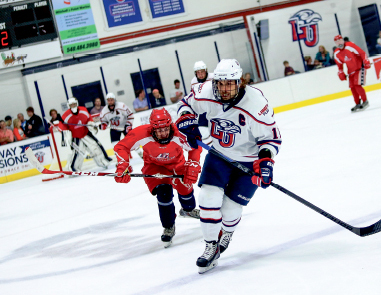 The Flames will hit the ice again at the LaHaye Ice Center Sept. 12 at 7 p.m. as they take on the Richmond Jr. A Team.